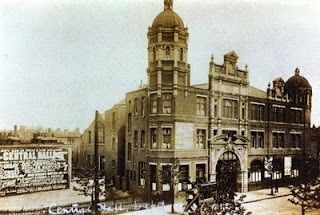 Deptford Central Hall was built on slum clearance land in 1903. It was deliberately designed so that it didn't look too church like to attract people into the building who might be put off by a traditional church. When it opened it had a membership of 221, which grew to 1646 by 1908. The mission always had a deep concern for the poverty in the neighbourhood which arose from the intermittent employment opportunities at the local docks. The mission sought to meet the needs of families through soup kitchens, breakfasts for children, distributions of used clothing and even a fund to enable children to go to the seaside From the 1920's the Mission had a concern for disabled and elderly people, reflected in what was then called "The Cripples Guild" and the "Cosy Corner" drop in, and what we now call the DPC The church was bombed in 1940 and the entire west side of the building was destroyed, including the original worship space and the tower. Planning the rebuilding took a long time, but the Mission as it is now opened in 1956, with a renewed energy for its work in the community The Mission celebrated its centenary in 2003.